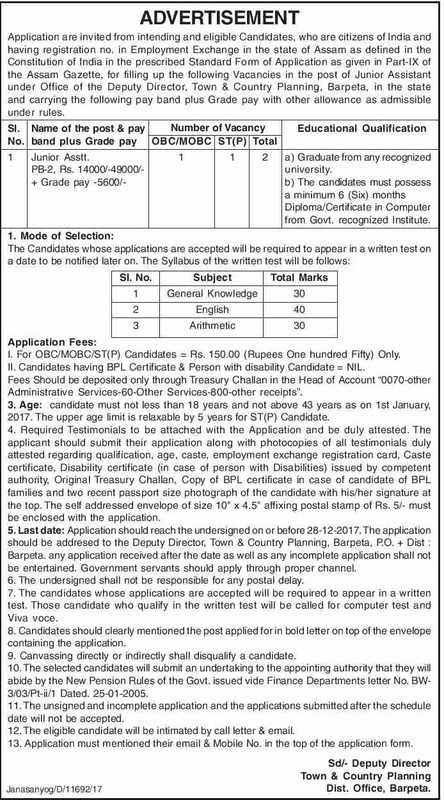 Deputy Director Town & Country planning, Barpeta District has recently announced a recruitment notification for the year 2017-18. So, Application are invited for filling up 2 Junior Assistant post under the Government of Assam. Eligible candidates, who are citizens of India and having registation no in Employment Exchange in the state of Assam as defined in the Constitution of India in the Prescribed Standard Form of Application as given in the Part-IX of the Assam Gazette, for filling up the following vacancies in the post of Junior Assistant under Office of the Deputy Director, Town & Country Planning, Barpeta, in the state and carrying the following pay band plus Grade Pay with other allowances as admissible under rules. Applications are invited in prescribed form published in the official website of Deputy Director Town & Country planning, Barpeta at www.assangovt.org. Online application form and Official advertisement available at this website. 1. Graduate form any recognized university. 2. The candidates must posses a minimum 6 months Diploma/Certificate in computer from Govt. recognized institute. Mode of Selection: The candidates whose applications are accepted will be required to Appear in written test on a date to be notified later on . The Syllabus of the Written test will be follows. Application Fees- For OBC, MOBC, ST(P) Candidates = Rs 150 only. Candidates having BPL certificate & Person with disability candidate = NIL. Fees should be deposited only through Treasury Challan in the Head of Account "0070-other Administrative services 60 other Services 800 other receipts".